NEW YORK – As the Rogers Cup approached three weeks ago, it seemed apparent that Canadian No. 2 Sharon Fichman wasn't going to be playing in Montreal. There wasn't much information about it other than she had sprained her ankle, then injured her knee during the World Team Tennis season in the U.S. in July. It turns out she tore her meniscus; Fichman had arthroscopic knee surgery at the end of the month. "It's related. For sure, of course. ... I came back too early (from the ankle injury) I think, and, yeah." Fichman said, less than 24 hours before she was due to play No. 4 seed Agnieszka Radwanska in the first round of the U.S. Open. "They got in there and apparently fixed it, they did something that’s supposed to make it good. So, I don’t know." It was obviously that the Rogers Cup was out of the question. "For sure, yeah," Fichman said. After a diligent period of rehab, the 23-year-old from Toronto was on court in New York Sunday. only her fourth on-court session since the surgery. Bucking the trend against mult-coloured kinesio tape, Fichman's knee tape was flesh-coloured. Unless you looked closely, you wouldn't even have known it was there. How does it feel? "Good," Ficman said. "I’m doing really well, My rehab is going great. I feel as good as anyone can feel." Fichman said the ankle also was "getting a lot better". So it was manageable? "I’m playing, so for sure, yeah," she said. 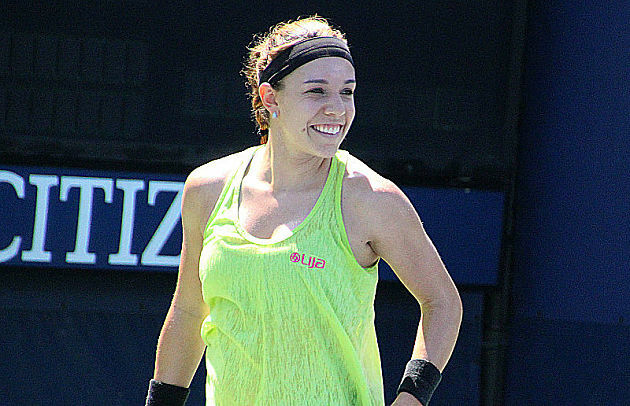 Fichman added that there was a bigger likelihood she would miss the U.S. Open than play it. "So at this point I’m really pleased, and I’m happy I’m here," she said. When did she made the decision to play in New York? "The day after knee surgery," she said. "It was a very tough goal and I think I surpassed it, to say the least. They said I’d be lucky to get back on court not even in the time the U.S. Open was supposed to happen. But it’s been good." One thing was certain; Fichman looked very, very happy to be out on the court Sunday, practicing with Saisai Cheng of China. She gets Louise Armstrong Stadium, the second-biggest court at the Billie Jean King National Tennis Center, for her match against Radwanska.